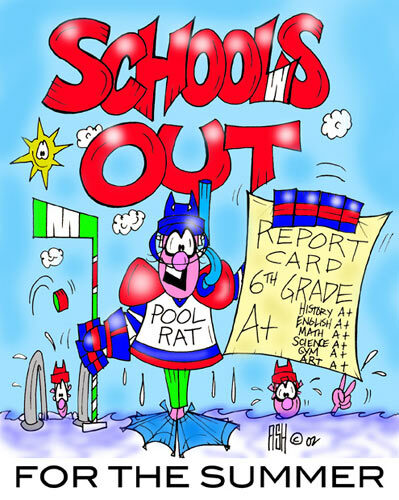 Serendipity Reviews: School's Out For Summer! School finished on Friday at 3.15pm and life has been extremely hectic ever since! I have just come back to check if my Monday Mail post has gone up and found that it was posted on Friday, so apologies to everyone reading my Monday Mail on Friday. School is out for 5 and 1/2 weeks. We normally get six weeks, but because we had two extra days at Easter, the nitpicking education department have taken it off our summer holiday. I really shouldn't moan as my children will get the full six weeks as we are going to be on holiday anyway. I know our summer holiday may seem short to my American readers, but as I understand, we have a lot more holidays during the year. We start the new school year with a week in October, usually around Halloween, followed by two weeks at Christmas. We then get a week around February time, which then brings us to two weeks at Easter. Then we get another week around end of May, before we get to the Summer holidays of six weeks. I think I prefer our holidays to the American ones, as your summer holiday seems rather long. Anyway, school holidays are here and we have six weeks to fill. We have a lovely weekend camping trip coming up, as well as a weekend in Wales seeing my Welsh relatives. The girls have camp for a week and then we also have a holiday in Fuereventura, which is one of the Canary Islands, to look forward too. Can't wait. I am sooo excited. So with holidays come and going, my blog may be a bit erratic over the next few weeks. Please excuse me, if I don't always check on your blogs. I do hate missing out on things, but time has a way of running away from me and I am not very fast at catching up. Off to the library now, to set the kids up on the library reading challenge. I will get my kids reading, if it kills me! Hurrah, hurrah, hurrah for the summer holidays! I've been given my life back! Mine have signed up to that challenge too :P The've been over there most days. Holidays is for the kids anyway Vivienne don't worry about us lot, I'll be the same I think. Anne - spend it wisely, it passes so quickly. Carmen - I must have missed something. Is this picture connected to a site? Wow, your school year runs long! Those weeks will fly by - so enjoy :) Good luck with the kids and the library challenge. 2 of my 3 kids (now young adults) are readers. My son does read the sports pages in the newspaper though - does that count??? It is so funny to think that you are celebrating the beginning of your summer break - and I am bemoaning the end of mine :) I know you and your family will have a fabulous time - no matter what adventures you choose to do! I agree that our summer vacations here are way too long! I like that yours are more spread throughout the year. And thankfully, we only have a few more weeks left of ours! The French school my son attended was on a schedule similar to yours, except they didn't get out quite this late for the summer. I have to admit that I like the American schedule better - it was always a pain to bet my son back into the school routine after each break. Thankfully, I don't have to worry about any of it anymore. I hope you have a great summer break with your girls. I think the kids are getting ready to go back to school here. I actually think I might agree with you - having lots of small breaks throughout the year does sound nice. Good luck with the girls' summer reading challenge! You do have a very different school schedule then here in the states. I prefer the longer summer, having had my kids in "year round" school with very short summers for a while some years ago. It was incredibly hot, and they were back in school instead of cooling off with a swim or cold beverage. BookfanMary - I would love my kids to end up as readers. It would make life so much easier. Molly - thank you. Enjoy what time you have left of yours too. Amanda - I don't think I would cope with such long holidays. Six weeks is long enough for me. Kathy - I didn't realise the French system was the same. I find it strange that there are so many different school holiday systems. Debi - I am glad you like the long holidays. I would like to try it just once. Enjoy the rest of yours and I must say it is lovely to have you back. Ladytink - where are you then? Jen - I cope with the smaller ones better. Suko - see we don't really get a hot summer here. It is normally hot before we break up and then rains continously once the holiday starts. I bet they are so excited to have vacation! Have fun at the library and you'll have to tell us how their summer reading program is going. My kids are grown, but I like your school year system better. I think US kids get too bored with so much time off in summer. Also, those kids who have little direction from parents as to how to keep busy, end up forgetting some of what they learned the previous year over the summer. The summer holidays are very long here in comparison! I don't know how I'd feel about having them spread throughout the year, mostly because our weather is so cold and rainy that we'd be stuck inside for the other holidays. But then I'm thinking your weather in the fall/winter/spring can't be that much less rainy than ours here in Oregon. I wish that we had more breaks thrown into our schooling when I was younger, but back then all I could think about was being out for three months. Grass is always greener, huh? Wow, you sure sound like you have a lot of fun things planned for the time off. Our school break here is quite long - from June to September I think it is. I think having the holidays spread out like that is a great idea though. Then the kids don't forget so much over the break either. Have fun! its almost time for my kids to go back to school now. I go back as a teacher in exactly 4 weeks today. The students start on Thursday, September 2. I think I would like the way your school year is broken up. It gives you time to pause a bit. Happy Summer!!! That's perfectly normal, Viv. I'd be surprised if you weren't. Enjoy! Happy Summer! Have an awesome summer, hunni. :D You deserve it. Where in Wales are you visiting relatives?